It seemed odd enough seeing our surroundings get steadily greener. For more than a month, red had been the world’s primary color. But then to add to the oddness, we suddenly found ourselves in Europe—or so it seemed. In fact, we were in New Norcia, Australia’s only monastic town. 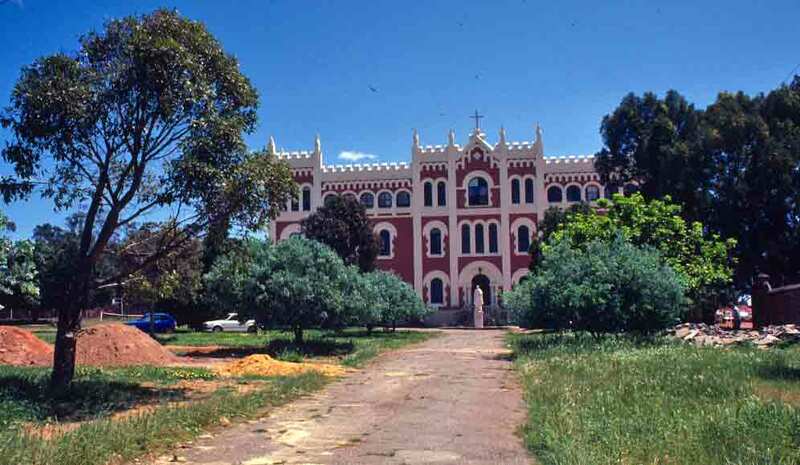 The story of New Norcia is actually anchored in Spanish history. In the 1830s, Spain experienced a civil war that pitted the new queen, Isabella II, and those who wanted greater democracy, modernization, and a constitution, against Isabella’s uncle, a reactionary who wanted to strengthen the monarchy and keep pretty much everything comfortably (for him) medieval. The Catholic Church sided with the uncle. However, Isabella won, and Spain got a constitution. During this civil war, because the monasteries were supporting and aiding the forces fighting against the queen, a number of monasteries were closed. Two displaced Benedictine monks, Dom José Benito Serra and Dom Rosendo Salvado, decided to see what lay on the other side of the world. The two men founded New Norcia, 80 miles north of Perth, Australia, in 1846. Salvado would spend the rest of his life building it into a successful mission. After Salvado died in 1900, New Norcia began to evolve into more of a traditional European-style monastic community. A new bishop, Bishop Fulgentius Torres, arrived in 1901 and began the transformation, building St Gertrude’s Ladies College in 1908 and St Ildephonsus College for boys in 1913, making improvements throughout the town, and bringing in painters and wood carvers to embellish the interiors. 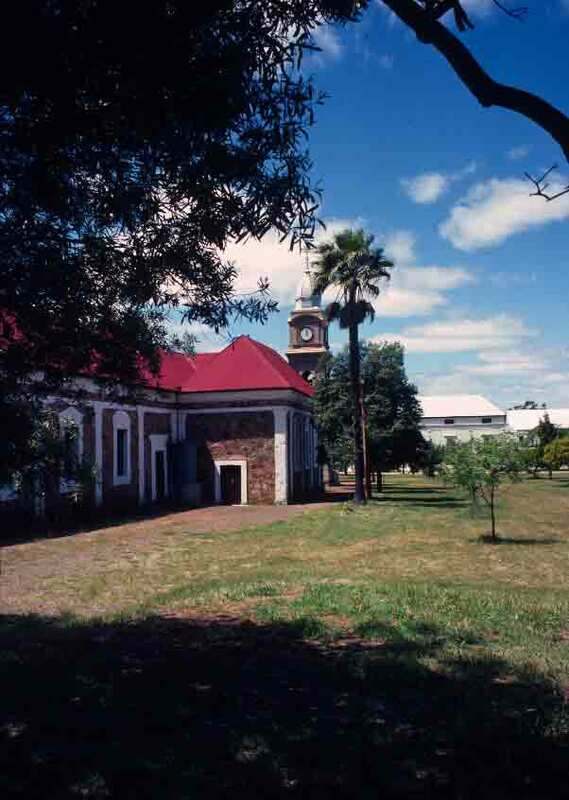 The community maintained its European style until the 1950s, when residents realized that, to survive, New Norcia needed to adopt a lifestyle more suited to the region. Today, the focus is on hospitality. New Norcia’s traditional crafts of self-sufficiency, bread making and olive oil production have been revived. The town now boasts a Museum and Art Gallery, an Education Center, a Hotel, and a Monastery Guesthouse, and daily, guided tours of the town are offered. I’ve been invited to participate in an Author Fair in Arlington Heights, IL, on Saturday October 4. The event will run from 1-5pm, with 10 minutes allowed for each of the 15 featured authors to speak or read from their books. (My time slot is at 3.) The rest of the time, we hope to be selling and autographing books! I’ve been too busy working to really promote my book or line up speaking engagements, so it was a delightful surprise to be invited to participate in this event. Hope it’s just the first of many. Heading farther south, we entered Kalbarri National Park. This park covers more than 700 square miles and encompasses a variety of geology, flora, and fauna. 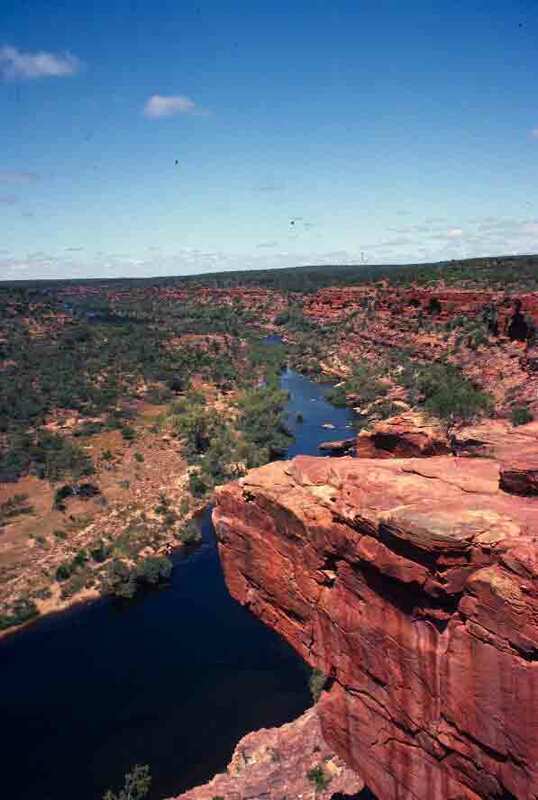 The park’s highlights include dramatic coastal scenery of steep cliffs carved by the sea, dazzling wildflowers during the winter and into spring (with twenty-one plant species found only in this region), and, most of all, the spectacular Murchison Gorge, carved by the Murchison River. Flowers can’t be missed if you’re there at the right season. Birds are abundant, and we saw a number of elegant raptors soaring on updrafts. Emus can be seen there, as well. Most of the mammals are nocturnal, so are not visible to us day-trippers, but western gray kangaroos do come out during the day. And I never get tired of kangaroos. Wonderful animals. There are also, of course, a number of lizards, including the prickly, ant-eating thorny devil, which I’d first encountered in the Centre. The town of Kalbarri, a charming little beachfront settlement that is home to a successful fishing industry, is also the base for visitors to the park. We stopped in Kalbarri, where we bought ice cream and then strolled across the beach and waded in the gentle surf. However, the highlight of our visit, and the place we spent the most time, was Murchison Gorge. We hiked, scrambled up and down cliffs, admired wildflowers, and delighted in our surroundings. I was particularly struck by the fact that, though we were still seeing red rocks, there was a lot more greenery than we’d become accustomed to. A favorite spot was the Hawks Head Lookout that jutted out over the gorge, offering an amazing view of the river below, the gorge, and the surrounding area. Below is one of many photos I took of Murchison Gorge, with the rock known as Hawks Head protruding into the image from the right. Continuing south, we crossed the Tropic of Capricorn. A relatively small, white sign marked the crossing, sticking up out of a sea of dry, red dirt. It did seem as though one could almost see the curve of the Earth, there, however—probably because the vista was so broad and so open. In another few hours, we reached Carnarvon, a small town perched on the banks of the Gascoyne River. The area has deep underground reservoirs of water, so even though the river looked dry, the town has enough water not only to survive, but to farm. 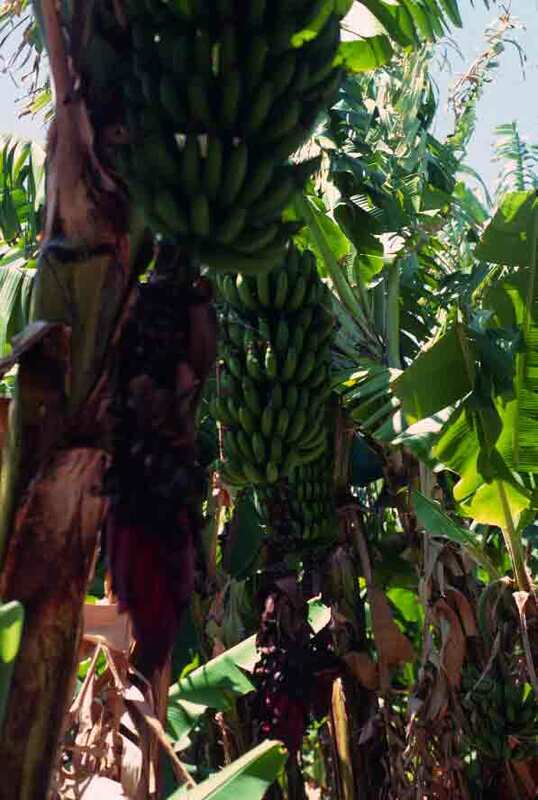 Our first stop in Carnarvon was at a banana plantation. The cool lushness of the groves of banana plants was certainly a sharp contrast to the arid rockiness of the land to which we’d grown accustomed. I loved the sight of all the bananas growing in great, hanging bundles. When I wrote a history of bananas a while back for Hungry Magazine, I mentioned this plantation, because it was here I first learned that bananas are not trees—they’re the world’s tallest herbs. There is no wood in them, and they die after one bunch of bananas. Of course, we enjoyed a snack while there. The frozen, chocolate-dipped bananas on offer were familiar to me, but I was amused to discover that neither the Brits nor the Aussies in the group had ever seen them before. Of course, at this point, my fan page just talks about my book on Australia—and I’m hoping it will get the word out, so people can discover what a great destination Australia is.